You Can't Stop Aging...But You Can Delay It! This is exactly what Naya's Naturals 1.7 oz. 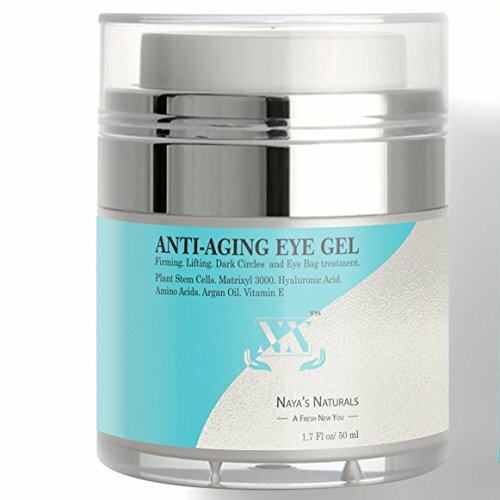 anti aging under eye cream does -it delays the appearance of wrinkles and preserves your youthful look! ...smooth your eye wrinkles, fine lines and crow's feet. ...reduce your dark circles, under eye bags, and puffy eyes. ...give you a bright and youthful, wide-awake look. ...rejuvenate and restore your damaged skin. ...hydrate the area around your eyes. The eco-friendly eye cream for dark circles and bags is rich in Vitamins C, A and E, and other elements that will nourish your skin and make it firmer and healthier looking! Why Choose Naya's Naturals Under Eye Wrinkle Cream? This moisturizing eye cream is made in a GMP Certified and FDA Registered Facility, and it is paraben free, cruelty free, and 100% natural. This unique blend has antioxidant, anti-inflammatory, antibacterial, smoothing, and revitalizing effects, so it is guaranteed good under eye cream for dark circles and to repair the skin around your eyes! Notice The Difference Or Your Money Back! Here at Naya's Naturals we're very confident about the efficacy of our dark circles under eye treatment gel, so we backed it up with a 100% risk free guarantee. BUY RISK FREE TODAY! REJUVENATE THE SKIN AROUND YOUR EYES: Naya's Naturals under eye gel will reduce the appearance of fine lines around your eyes. This gentle yet potent eye wrinkle cream will smooth the fine lines, minimize under eye circles, crow's feet and other signs of aging, and restore the elasticity in the areas around your eyes. The eye moisturizer gel promotes tissue regeneration, so your skin will become firmer, and your eyes will look more youthful. GET A BRIGHT WIDE-AWAKE LOOK: Why cover your dark circles with concealer, when you can make them disappear? This detoxifying under eye gel for dark circles works to brighten your face and make dark circles and puffy under eye bags disappear. The under eye circle cream also has anti-inflammatory properties, so it will remove the nighttime tired eye puffiness and darkness and give you an instant refreshed and lifted look. 100% RISK FREE PURCHASE: We know you'll love your new anti aging eye cream and under eye treatment. Naya's Naturals has backed our effective eye cream for dark circles and wrinkles with a 100% money back guarantee, making this a completely risk free purchase. Contact us with any concerns, your satisfaction is our priority. GET RID OF YOUR UNDER EYE WOES NOW WITH NAYA'S EYE CREAM FOR DARK CIRCLES AND PUFFINESS! SUPER EFFECTIVE EYE MOISTURIZING TREATMENT: Our under eye moisturizer contains hyaluronic acid, which has the stunning capacity to attract and hold vast amounts of moisture. Thanks to this element's impressive hydrating ability to replenish moisture, your eyes will look and feel more hydrated, softer, and smoother. Try our natural eye cream and see the results for yourself! ALL-NATURAL FORMULA: Our amazing under eye products are made in a GMP Certified and FDA Registered Facility, using the highest rated organic and naturally derived ingredients ONLY! The main ingredients of this under eye serum for dark circles are Globularia Cordifolia plant stem cell, Matrixyl 3000 peptides, cucumber extract, Euphrasia Rostkoviana Eye Bright herb, hyaluronic acid, pure Aloe Vera gel, green tea extract, Jojoba oil, and Argan oil. If you have any questions about this product by Naya's Naturals, contact us by completing and submitting the form below. If you are looking for a specif part number, please include it with your message.